1) Who drinks outside a library in the middle of the night? c. Patrons who REALLY want to get a good seat in the morning? 2) Was my library the party destination? Or was this just one stop of many on a late-night library wine tour? 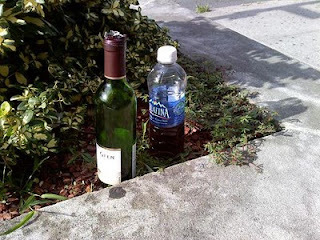 3) Why is there wine in the water bottle? a. Was the wine-drinker saving some for later? just split the bottle? Germs? of person who cares about germs? 4) Why didn't the wine drinker(s) place the bottles in the garbage can a few feet away? (Never mind about recycling; we're way past that issue here). 5) Why wasn't I invited? You are hysterical, I'm loving your posts.